This story took place in April of 2007, on the Sinai Peninsula in Egypt. Although I understand that it is not the safest place to travel at the present, 5 years ago it was a popular destination. The main tourist hub was around the boardwalk town of Dahab on the gulf of Aqaba. While there most people chose to climb nearby Mt. Sinai; the mountain scaled by Moses in the Old Testament. It was suggested to us that we choose to climb the mountain at night, as it was much cooler than the day. And so, after procuring the necessary flashlights, we did. 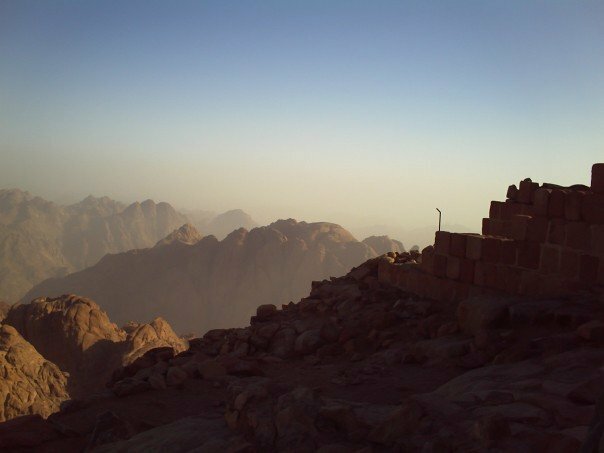 “Only 750 steps to go,” my Bedouin guide informs me, as I stare up the seemingly vertical surface of Mount Sinai. This morning the idea of making this legendary climb seemed like a fun idea. I figured it would be nothing more than a nocturnal hike up a mountain to watch the sunrise, what could be nicer? A trail and stairs have been added since Moses made this climb, so how hard could it be? At 11:00pm my friends and I catch the bus that will take us to meet our guide at the base of Mount Sinai and start the two and a half hour climb. “Only 750 steps to go.” I look up. ‘These are not steps!’ I’m slightly panicky. ‘These are boulders arranged by giants to vaguely resemble what we mere mortals refer to as steps.’ I groan; it’s roughly 3:00 in the morning. About 400 ‘steps’ up I narrowly avoid being knocked back down the mountain by a rampaging donkey. Excitement level – In pain. Bundled up in my blanket watching the sun rise over the mountains. I had written this narrative of my climb a few years ago, but it is missing the best part. 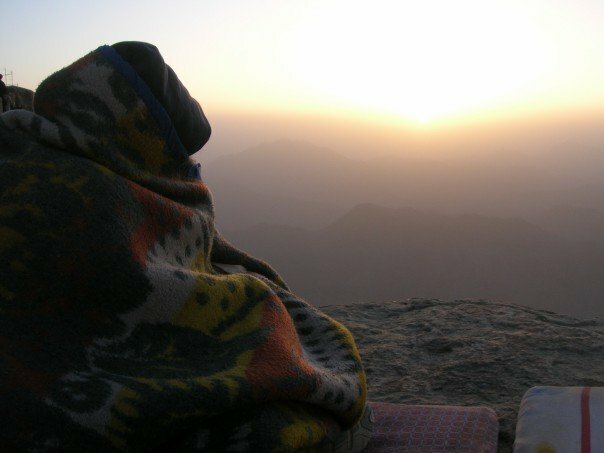 When we arrived at the top, our bedouin guide led us to his spot – the place on the mountain he has claimed exclusively for his climbers to rest and wait for the sun to rise. His spot was circular, approx. 8 feet in diameter and completely convex, with nothing between you and a 2285 metre drop to the jagged rocks below. So, of course, he tells us to have a nap… better not roll in your sleep. 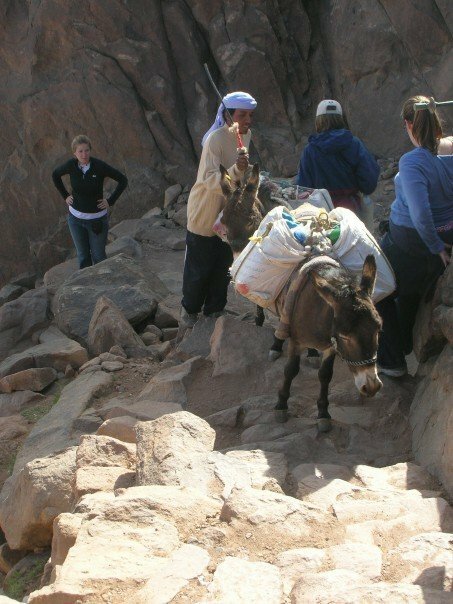 We met up again with the donkey on the way back down the mountain. Wow. glad you decided it was worth it in the end. I did a similar trek to Macchu Pichu. While the walk in the dark was a challenge at times, it was totally worth it! Would love to do this climb. The sunrise looks gorgeous. I would really like to do the Macchu Pichu trek!